How to reset airbag warning light on a Ford Mustang. To know what is the problem on your car you must count how many times the air bag lamp is flashing. 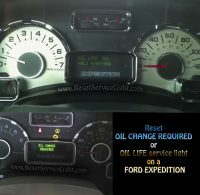 Reset oil service light Ford F 550 Series. From years: 2009, 2010, 2011, 2012. Reset oil service light Ford F 450 Series. How to reset maintenance light, reset service light indicator. Can be made manually by use buttons on car dash board.